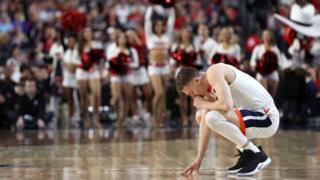 As the buzzer sounded at the end of the NCAA college basketball final, fans of the Virginia Cavaliers celebrated their team's victory over Texas Tech. But amid the confetti, TV cameras and cheering, Virginia's star player Kyle Guy marked a very personal victory. The 21-year-old has spoken openly about living with crippling anxiety, and the pressure that comes with being in the public eye. Virginia's win led some to call the student athlete "inspirational". Guy was voted Final Four Most Outstanding Player, and scored the deciding three free throws in the high-pressure closing moments of the semi-final game. In April last year Guy published a confessional letter addressed to himself, detailing his struggle with mental health and the pressure to perform. "Not everyone knows, but you've been taking medication for your anxiety attacks all season. You've kept it a secret because you didn't want to be viewed as weak," he wrote in a post on Facebook. "They weren't with you when you burst into tears in the middle of practice and you didn't know why. And despite that, you kept pushing. They weren't there every time your fiancé [sic] helped calm you down night after night when the pressure seemed to consume you, but you kept pushing. They don't understand you couldn't smile through the latter half of the season because the anxiety and pressure was eating at you, but you still kept pushing." A few weeks later, after Virginia's shock defeat to a low-ranking team during last year's season, he wrote a follow-up letter. He detailed how the defeat, and the subsequent death threats he received, had further affected his state of mind. "I was hit with an overwhelming feeling of sadness, anxiety, and failure... I went on to sit in the showers and cry alone," he wrote. However, since speaking about his struggle, the basketball star has become an ambassador for mental health awareness in college sport and, thanks to support from his doctor and family, says his anxiety is under control. "It helps me to talk about what I'm [going through]. It may not help everybody. That's why I wrote those letters, why I wanted to be a beacon of hope to others," Guy told USA Today in an article published on Tuesday. "That means more to me than anything I could ever do on the basketball court, to be able to help someone who is suffering. "I don't pretend to walk in anyone's shoes but I know it's not easy sometimes." During this year's NCAA final, many on social media applauded Guy's openness and resilience. "My message to people going through something, and I hope they saw it with our story, with my story, is that when you're in a dark place you can absolutely come out on top. It's gets lighter," the player said. "The main thing is, you're not alone."